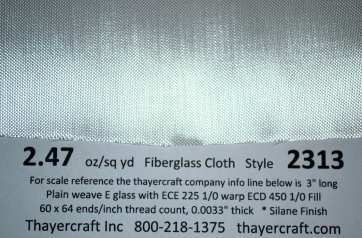 Style 2313 is a 2.47 oz/sq yd plain tight weave E-glass fiberglass fabric with a high thread count of 60x64 ends/inch compared to the 24x22 for 1522, which is heavier of course, but even allowing for that. Style 2313 is finished in a silane for epoxy resins. Though 2313 is not a standard open weave surfboard type fiberglass cloth we have had quite a few surfboard and stand up paddle board builders to use it. You, as the surfboard builder, know much more about what you can or can't use than I can even imagine. It seems like too tight of a weave for surfboards to me. But any group of people that were smart enough to help NASA solve some of the early rocket designs are smart enough to use cloth not meant for surfboards. I have to say thank you and keep up the good work. But if you do want to try some here's your chance. You have a big variety of widths and yards to pick from here with Free shipping. All cloth is rolled on 2" PVC pipe and carefully packed. All prices are per roll with free shipping to the 48 continental United States.